Meet the white sand beach or black sand, probably is common things. 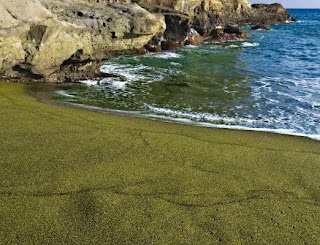 In Hawaii, there is a beach with green sand. While on vacation to Hawaii, visiting the beach and take a handful of sand is unique for a souvenir. 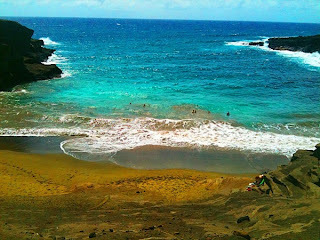 Green sand Beach is named Papakolea Beach, and is in the area of ​​Ka'u, Hawaii. 49,000 years ago, a volcano erupted and spewed ash unique green sand. The green color comes from rock fragments called Olivine crystals in the mountain. Green sand is the result of a mixture of ash, lava and debris Olivine crystals. Among the natives, Olivine known as 'diamond Hawaii'. Although there is sand on the beach Papakolea is not purely derived from the crystal flake Olovine, but the beauty of this beach can make it a 'diamond Hawaii'. To reach this beach is not easy. Its location is surrounded by rocks makes you have to climb first. Prepare your best sandals for rock climbing that will climb quite challenging. But not to worry, because the rock is a rock climb in dry, so it is not slippery. The results of the sweat of the climb you will be paid at the sight of the beauty and uniqueness of Papakolea Beach. Uniquely, the more exposed to the waves, the sand will be colored green. Indulge your eyes staring at the clear blue sea water, sand like olive green and brown rocks. Green sand, on the beach Papakolea, is not always green. Because the future of green Olivine crystals this will fade, but not in the near future. Visit Papakolea Beach, to feel different sensations in enjoying the beach in Hawaii.